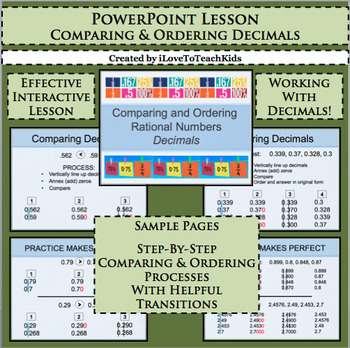 COMPARE AND ORDER DECIMALS WITH EASE USING THIS POWERPOINT! Use this extremely thorough and thoughtful approach to teaching comparing and ordering decimals and develop deep understanding for students. Complete Powerpoint with lesson and practice problems makes for meaningful student learning. Transitions through the slides show individual steps taken to solve each problem. You will receive an editable PowerPoint file that can be altered to fit your specific needs. The possibilities for you and your students are endless!